Steve teaches the popular kids song "Old MacDonald Had a Farm" in this lesson. This is a great lesson and lots of fun! Thanks Steve! Playing the guitar can be a fun, educational, and productive activity for children of all ages. Introduce your child to the wonderful world of music with this lesson series. In this lesson, the first in the Kids and Guitar series, Steve Eulberg introduces the guitar and its many wonders. Steve Eulberg talks about the parts of the guitar and how they function. You also get to see some of his wonderful artwork. Steve explains how to properly hold your guitar. He also explains how the strings are named. Steve prepares you to play your first notes in this lesson. Get ready for some fun! Steve explains finger placement and proper playing technique. He also teaches a fun new song. Learning how to properly tune the guitar is an absolutely essential skill. In this lesson, Steve walks you through the tuning process. In this lesson, Steve Eulberg provides a new exercise that will challenge your mind and hands. Steve introduces some basic chords. Then, he teaches the classic song "Hot Cross Buns." Steve explains proper picking hand technique. Steve Eulberg covers the classic children's song "Mary Had a Little Lamb." Steve teaches an easy children's song called "Aunt Rhody." We've all heard the song. Now it's time to play it! Steve teaches a classic song called "Paw Paw Patch" in this lesson. Steve Eulberg teaches the popular kids song "The Wheels on the Bus." 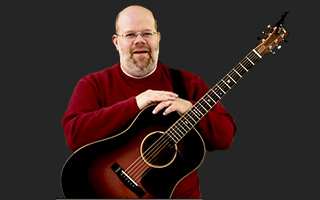 In this lesson, Steve Eulberg teaches the song "The Wheels on the Bus" in a different key. Steve teaches "Ode to Joy," a catchy and highly recognizable tune. Steve demonstrates techniques to accomplish the ability to move your fingers independently. Steve teaches the E minor chord. This chord was first introduced in the song "Ode to Joy" and serves as an introduction to the remaining minor chords that will be taught in this series. Steve introduces the A minor chord. You have an opportunity to compare and contrast the difference in sound between major and minor chords in this lesson. Steve breaks away from left hand positions to focus on picking hand technique. Give your fretting hand a workout with this 4 fret exercise! Steve Eulberg explains an exercise that will develop your ability to perform position shifts. Steve shows how to "monkey around" with a fret hand exercise designed to develop creativity and proper technique. Steve demonstrates the D minor chord. Steve uses the new D minor chord from Lesson 25 in the classic song "Joshua Fit the Battle of Jericho." Steve demonstrates some techniques that help transition smoothly between chords. This fantastic lesson explains that the strum hand determines when we hear the sound, and the "what" hand creates what we hear. Steve breaks explains how notes are laid out in first position and how the 5th fret is used to shorten up the work needed to play full scales. Welcome to the first installment of a series that details how various chords are formed! Get started by learning some "G" chords. Steve moves from room to room in the house of chords. This lesson features the room of C.
Steve continues through the House of Chords. In this lesson, he has found himself in the room of A.
Steve welcomes you to the room of E as he continues to take you on a tour of the House of Chords. Steve finally completes his tour of the House of Chords with the room of D.
It's time to introduce a new strumming technique commonly referred to as the "boom-chuck." This lesson will help develop more advanced picking hand skill. Steve continues with part 2 of his advanced strumming techniques. Diving more in depth and getting a better grasp on the alternate "boom chuck" style of picking, Steve continues with part 3 of his advanced strumming techniques. Steve introduces full chord strumming techniques in part 4 of his advanced strumming lessons. Steve demonstrates how to "alternate the boom" to a different string in this Advanced Strumming Pt. 5 Lesson. Welcome to part 6 in a series of advanced strumming techniques. This lesson demonstrates how to "alternate the boom" on two different strings. Steve Breaks down what the D chord looks like when applying the "boom chuck" strum technique. Steve finishes off his strumming sessions by demonstrating additional alternating bass patterns within the context of the "boom chuck" strum pattern.